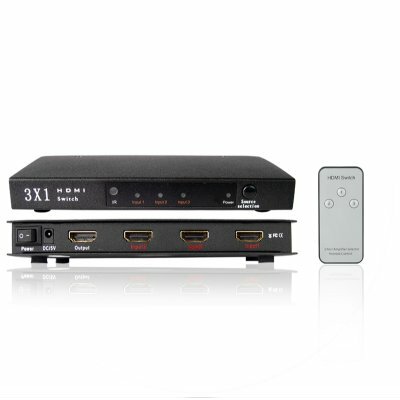 Successfully Added HDMI Switcher 3 x 1 - Full HD 1080P to your Shopping Cart. For the latest in HD devices including HDTVs, HD Camcorders, or PS3s, Chinavasion presents this easy to use HDMI accessory Switcher for quickly connecting and switching between HD devices to display on your HDTV with full 1080P support. With the 3 HDMI ports fully coated in 25K gold for the best connection speed, easy remote control of the switching, and multiple resolution possibilities suiting every need, this is the device you need to reduce the headache of too many wires and connections. With Chinavasion, source this wholesale item for your own online storefront for incredible profit returns, or buy one sample for yourself to get the most out of your HDTV and HD devices.. I have this product connected to a Plasma TV in Brazil and it´s working perfectly. I connect a PS3, Digital TV Receiver and a DVD Player through it and all of then have excellent images and sound. The installation is easy, just plug and play. Only one minor issue, the equipment does not maintain the previous port selected after it´s turned off. In this case just plug your preferred device to the first port and it will be selected by default when the switch is turned on. Very good cost X benefice.